Building on the already popular Big Lunch initiative, people will be encouraged to share lunch with neighbours and friends as part of the Diamond Jubilee celebrations. This may take the form of a traditional street party or a picnic lunch in small or larger groups. This event will take place on the Thames and consist of up to 1,000 boats assembled from across the UK, the Commonwealth and around the world. The Queen will travel in the Royal Barge which will lead the flotilla. There will be a televised Diamond Jubilee Concert at Buckingham Palace organised by the BBC with tickets being available to UK residents by public ballot. The musical programme for the concert is still being planned and is expected to feature British and Commonwealth musicians. A network of 2,012 Beacons will be lit by communities and individuals throughout the UK, the Channel Islands, the Isle of Man and the Commonwealth. As in 2002, The Queen will light the National Beacon. There will be a Service of Thanksgiving at St Paul’s Cathedral and a formal carriage Procession by The Queen. The Epsom Derby programme has started on BBC1. The atmosphere is clearly very festive. The Queen is due to process down the course shortly. HM wearing a beautiful royal blue today. The Queen has arrived at Epsom. She is with the DOE. William, Harry, and Catherine are not there this year. Beatrice, Eugenie, Sophie Wessex Princess Michel and P.Alexandra. Is William, Kate & Harry attending the races? I thought they would be attending all the events. The Duke and Duchess of Cambridge, Prince Harry, the Prince of Wales and the Duchess of Cornwall were not scheduled to attend Epsom Derby. All of them will be attending most other events though. The Queen was today greeted by cheering crowds as she made her first appearance of her Diamond Jubilee four-day-long weekend of celebrations at Epsom racecourse. Wearing a regal Royal blue coat with matching hat over a white floral gown, Queen Elizabeth smiled and waved as hundreds of thousands of race-goers flew flags and shouted messages of support from the course sidelines covered in bunting. The Queen and Prince Philip were joined by a large party which included the Duke of York and his daughters Princess Beatrice and Princess Eugenie and the monarch's racing manager John Warren. Also Google is celebrating the Jubilee check it out! Richard Palmer has given us an "expected" dress code for the next 3 days. Military = Sunday, Lounge suits = Monday, Morning suit = Tuesday. but, why, why? Kate and will dont go to Epsom derby???????????????? I think they didn't go to the Derby because they didn't want to take away the attention from the Queen. Since we'll be seeing them all weekend long I think they figured missing this one wasn't a huge deal. Atleast that's my guess. 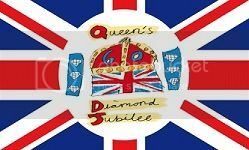 Speculation was mounting last night that the Queen will then make a televised address thanking the nation for joining in her Diamond Jubilee celebrations.